Constellation employees are teaming up to make National Volunteer Week (April 11-15) a month-long celebration of the communities we serve. National Volunteer Week is an annual, nationwide movement of people working to improve their communities through service. 2016 marks the tenth consecutive year employees from across the Exelon family of companies have celebrated. Hundreds of employees will volunteer at more than 20 employee-led service projects focused on our key community impact areas of education, the environment and economic and community development throughout the month of April. The projects will include park and watershed clean-ups, building homes with Habitat for Humanity, book and supply drives for local schools, and providing services to members of our community facing homelessness. Follow Constellation’s National Volunteer Week activity on social media by following @ConstellationEG and #NVW2016. 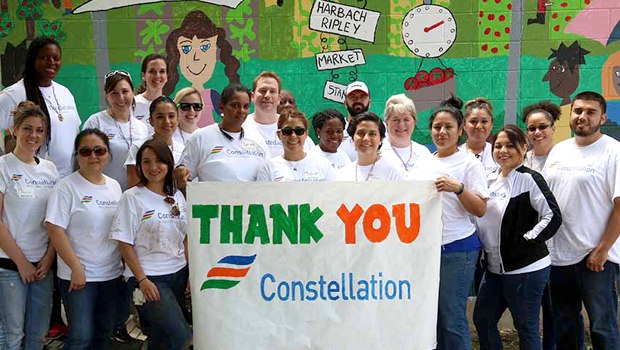 Constellation is committed to giving back to the communities in which we live and work. In 2015, Constellation employee volunteers recorded more than 24,000 hours of service to community nonprofit organizations. For more information about Constellation’s community programs, visit the Community Outreach section of constellation.com.